Hello, when I order the Lee Load Master Press for 229.99 is this a kit price, if I want the Auto Drum Powder Measure instead of the double disk powder measure is it possible to order together, Or do I need to order the Auto Drum seperate, thanks, I will be ordering soon, s.. Thanks for the great products and service.. The Lee Precision .224 Lube & Sizing Kit is the fastest and easiest way to lubricate and size cast bullets. The Sizing Die has Standard 7/8x14 threads which are compatible with most brands of Single Stage Presses. Bullets are pushed through the sizing die nose first, so no special nose punches are needed. Gas checks are automatically seated and crimped in place. Sized bullets are dropped into a container. The Lee Precision Lube & Sizing kit is Intended for use on Single Stage Presses ONLY. Lee recommends bullets be relubed after sizing to be sure the sized portion is coated with Alox. All lead bullets MUST be lubricated, but it is not absolutely necessary to size all cast bullets. Bullets must be sized if they are so large that they expand the case too much to freely enter the gun's chamber. Sizing sometimes helps accuracy by making the bullet uniform in diameter. Sizing helps ensure uniform start pressure and better accuracy. Standard 7/8 x 14 threads are compatible with most brands of Single Stage Presses. Bullets are pushed through the sizing die nose first, no special nose punches are needed. Gas checks are automatically seated and crimped in place. Sized bullets are captured in the special container. The Lee Precision Lube & Sizing kit is Intended for use on Single Stage Presses ONLY. The push through Punch is used in place of a Shell Holder in the Ram. Lee recommends bullets be relubed after sizing to be sure the sized portion is coated with Alox. All lead bullets MUST be lubricated, but it is not absolutely necessary to size all cast bullets. Bullets must be sized if they are so large that they expand the case too much to freely enter the gun's chamber. Sizing sometimes helps accuracy by making the bullet uniform in diameter. Sizing helps ensure uniform start pressure and better accuracy. 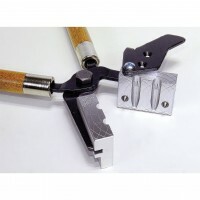 Gas checks can be installed with this tool. Simply place the gas check on the base of the bullet before sizing. 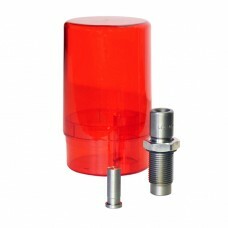 Place bullets in provided red plastic container and drop in Lee Liquid Alox onto the bullets. Gently shake the bullets in an orbital motion to coat the bullets. If they do not coat completely, add a little more lube. Spread the bullets onto waxed paper and let dry overnight. Load at least one bullet into a case and check to be sure it easily chambers in the gun. If it fits tightly, you must resize the bullet before loading. Screw the sizing die into any standard reloading press. Exact depth is not important. Install the bullet punch into the ram. This fits all rams that use standard shellholders. Place the red plastic container with the lubed bullets inside, on top of the sizing die. Place bullet on the punch and push the bullet through the die. When 3/4 of the bullets have been loaded, lift the red plastic container off the die. Invert the holder before opening. For rifle and hot pistol loads, it is best to relube the bullets to ensure the sized portion is recoated. Lee Liquid Alox lube is not included and must be ordered separately. Prop 65: Warning: for Lube and SIze kits: WARNING: handling lead objects may expose you and others in the area to lead, which is known to the State of California to cause reproductive harm and cancer. For more information, go to www.P65Warnings.ca.gov. See instructions on Reducing Exposure supplied with product. The Lee Precision .501 Lube & Sizing Kit is the fastest and easiest way to lubricate and size cast .. 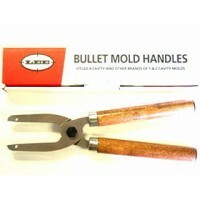 This Lee Precision Double Cavity Bullet Mold produces .314 diameter 90 grain, Semi Wad Cutter nose .. This Lee Double Cavity Mold produces a gas checked .225 diameter 55 grain round with flat bullet sui.. The Lee Precision .339 Lube & Sizing Kit is the fastest and easiest way to lubricate and size cast.. The Lee Precision .278 Lube & Sizing Kit is the fastest and easiest way to lubricate and size cast..
Lee Precision Commercial Mold Handles fits Lee 6-Cavity Molds, also most other brands of single & do.. The Lee Precision .356 Lube & Sizing Kit is the fastest and easiest way to lubricate and size cast.. The Lee Precision .451 Lube & Sizing Kit is the fastest and easiest way to lubricate and size cast ..